Home / Looks / Face / Why am I getting more hair on my chin? Why am I getting more hair on my chin? Hirsutism, or excessive hair growth, can affect anybody during perimenopause as well as actual menopause and beyond, even if they have never had a hair growth problem before. And when it’s on your face, it can make you feel very self conscious. So if you find yourself reaching for the tweezers a little more often or are noticing hairs sprouting where hairs never sprouted before, you’re certainly not alone. But that doesn’t make you feel any better when you’re sitting in a meeting absently feeling your chin for ‘beard’. As with most menopausal symptoms, facial hair differs from woman to woman – some might not get any, others just a few stray ones here and there, while others still can discover quite heavy growths. As with most things menopause, your hormones are the culprit for this excess hair. Your facial hair is controlled by a hormone called dihydrotestosterone (DHT) which in turn is kept in check by your oestrogen dominating your testosterone levels. However, when your oestrogen levels drop during menopause, your DHT levels can go up, increasing the presence of DHT in your hair follicles. Don’t panic, as there are plenty of options if you have facial hair that’s bothering you. Laser hair removal is not necessarily permanent and some people prefer to call it laser hair reduction, as you may need to continue the treatments in the long term. This is important because it catches a lot of people out. Most people believe that, if they pluck hairs on their chin every morning, they pluck the same hairs. Sadly, this is not the case as it takes so long for hairs to grow through that we pluck only a fraction of the active hairs each day. If we pluck six hairs then we most likely have 60 actively growing! It is vital to understand this as you’ll need to stop all plucking around four weeks before you have laser treatment. As a result of this, some people think that the laser has caused an increase in growth after the first session. Lasers only work on hair which contains pigment, because it absorbs the laser light and allows the heat to build up and diffuse throughout the whole follicle to destroy it. The most effective time for destroying your hair follicle is when it is in its growing stage (anagen). 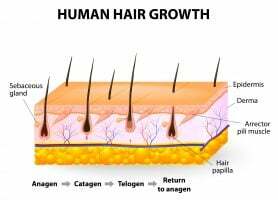 However, every single follicle on our body goes through a repeated three-stage cycle: anlagen (growing), catagen (transition) and telogen (resting) before returning to the anagen stage. This is why you often need multiple treatments to eradicate the hairs in any one area. You’ll need a full medical evaluation before your treatment, you make sure you don’t have any conditions such as vitiligo. After that you’ll need a test patch to check the reaction of your hair and skin. You’ll be able to have the full treatment after 24 hours if you have light skin and up to a month later if your skin is very dark. Not all lasers or skin types are the same so if you have a darker skin type, such as Asian or Afro Caribbean, make sure that the clinic has the correct laser for your skin. Generally speaking Alexandrite lasers are good for lighter skin types but Nd YAG lasers must be used on darker skins or burns will ensue, which will lead in turn to potential pigment disturbance. If in doubt, ask to see before and after photos during your consultation and never go to a clinic where treatment is offered without a full consultation, medical evaluation and test patch. In general, these are extremely successful treatments which can offer you life-changing improvements – they are also effective if you have Polycystic Ovary Syndrome. Other hair removal options are waxing or threading. You’d typically expect to have to get a wax or thread every two to six weeks, depending on your own rate of regrowth. Because the hair does need to be a certain length to be rewaxed, some women choose to bleach their facial hair in between getting it waxed or threaded, which certainly reduces its appearance. Waxing and threading both remove the hair from the root – just as plucking does – and so give very similar results. Threading is more ‘natural’ in as much as only a piece of cotton is used to remove the hair and no hot wax is involved. However, some people find threading more uncomfortable than waxing, not least because the threading treatment time is slower than waxing. All of the above forms of hair removal are suitable for the removal of excess facial hair caused by the menopause and often the deciding factors will come down to how much money a woman is prepared to spend and the frequency and length of time she is willing to dedicate to visiting her salon or clinic of choice. The one form of hair removal which is never recommended for getting rid of unwanted female facial hair is shaving. Shaving cuts the hair off at angle, which results in ‘stubble’, and regrowth can be as quick as a few hours (think five o’clock shadow). The more you shave, the more quickly the hair will grow back, and this can be a difficult pattern to break. Menopause experts say that for some women, balancing their hormones by taking some types of Hormone Replacement Therapy can really help to improve their facial hair. Facial hair is a common aspect of menopause, but not one needs to blight your life… there are lots of options for tackling it if you feel it’s becoming a problem.